Although I have yet to use WP8 the one aspect I haven’t heard any complaints about is the keyboard (keep in mind we’ve heard some ridiculous complaints such as “I can’t hold the phone in my hand for too long”). 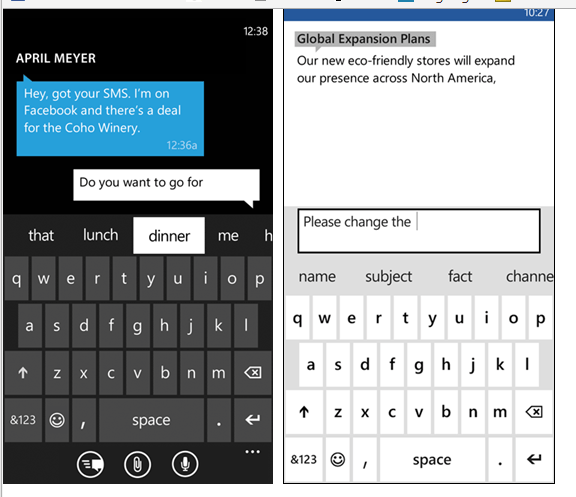 Of course if the WP8 keyboard is anything like WP7’s then it’s obvious why no-ones complaining. In a BlogPost on blog.Windows.com the people behind WP’s keyboard went into details about the magic behind the great Keyboard. First off WP8 brings a new feature called “Word Flow” which watches, learns and then predicts what you’re going to type next based on your typing history. With Microsoft boasting a 94% accurate autocorrect score, out of the box; not too shabby eh? All this is pretty amazing, but on the off chance that someone who can do something about it is reading, where is my haptic feedback!!??? Also why one earth can’t I edit my custom dictionary? I once accidentally added TRUE as a word, and now every-time I type true, it goes into full caps rage mode.